As we were only in Kyoto for a night we left some bags at the luggage office, then jumped onto the clean, efficient subway system – after a the usual few blank stares at the ticket machine of course. Having checked into our downtown hotel, it was off into the streets to explore. 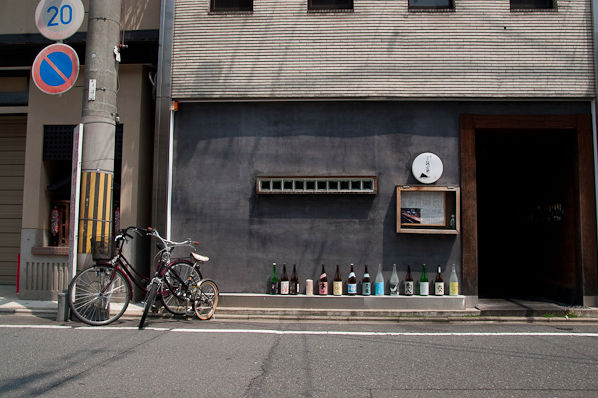 Cute little boutique shops, cafes extended from record shops and quiet streets meant that Kyoto downtown is a highly enjoyable wander with plenty of design tidbits to enjoy. 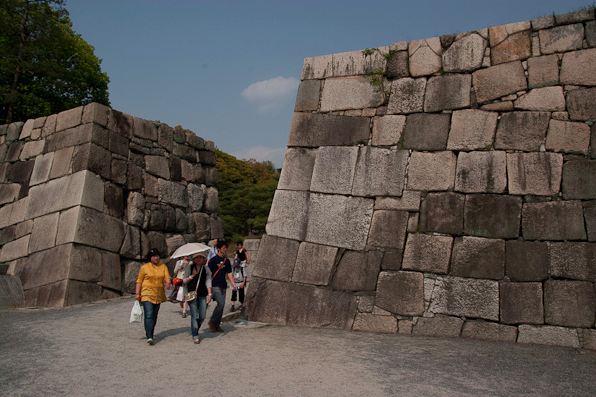 City wandering over, Nijo Castle [photos] was the next port of call. An epic walled fortress filled with beautiful buildings and plants. Then a short bus ride up to the bamboo forest, where towering bamboo plants are grown and harvested. There is a train ride that takes you up to the top of the forest, but be warned it doesn’t run that regularly so plan ahead. 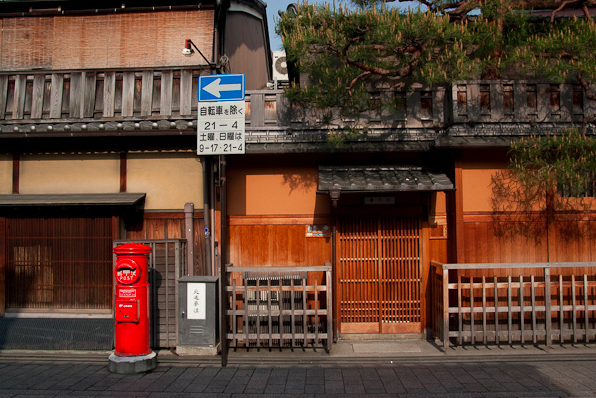 Back into town and as the sun set we got ready to go for a Kyoto-ryori dinner at the amazing Fuya-cho Sanjo [photos]. Nestled off a back street, and with no obvious sign (you have to go into a courtyard off the street) you knock on the door and someone lets you in. Inside we sat at the counter watching the chefs prepare all the food – and settled back to enjoy one of the fixed menus. Sushi, stews and more came out – each course small, but perfectly formed. The chefs were chatty and friendly, trying out some of their English and keeping our sake topped off. Mmm… sake. All we really did was smile happily at the amazing food and say ‘oishi’ and that seemed to be keeping up our side of the bargain. Fuyacho Sanjo is on 310 Shimohakusan-cho, Fuya-cho, Sanjo-aguru Higashigawa (T 075 241 1100). After some after dinner cocktails we walked down to the river, where the local kids gathered and drank in the gloom. This led us down to Pontocho one of the four geisha districts in Kyoto. The red lanterns adorned with birds, a geisha symbol, adorned all the doorways but other than that the street seemed like a quiet suburb, except for one solitary geisha who rushed past us as we neared the end of the street. The next day we returned to the same street to see it in the daylight, getting an early start as we had to head to Tokyo later that day – the street was still quiet, this time glistening from a street cleaning in the early morning sun. We crossed the river to Gion, another geisha district, before walking up the hill towards Toji a towering pagoda that easily stands above the small houses around it. This area is the major temple walk within Kyoto and there is so much to see round there, from the serenity of the Ryozen Kannon War Memorial with its drawers full of cards listing the war dead, to the imposing red gates and white stones of the Heian Shrine. In between there are many small streets to walk around and explore (and get lost in), with little shops full of interesting trinkets such as kimono material and shoes. Next time I’m back there this area will get a full day to enjoy and spend time watching people go about their business, instead it was time to head to Kyoto station to catch another train for the final leg of the journey.. Tokyo! Kyoto is an amazing city, one of our favourite parts of the whole trip to Japan and Korea. There is so much to see, from the culture of the Geisha and the temples, to the modern delights of design shops and restaurants. All this in a city that is walkable yet has an extensive subway system and likes cyclists. What more could you want? You can see the full set of Kyoto pictures here.